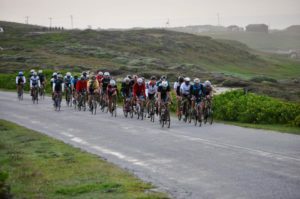 This feeling goes into overdrive when we have our annual TeamTissinkI IMSA training camp. 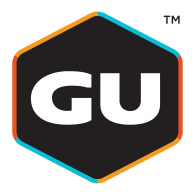 What can be better than being coached by the best, surrounded by team members from around the globe, getting a goodie bag full of GU nutrition, bottles and a 3T training camp t-shirt, in the best city in the world, Port Elizabeth. Not much actually. 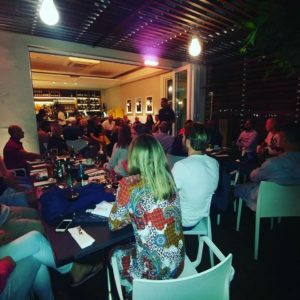 Starting off with a supper at Bocadillos and a briefing by Ray of the line up for the weekend, followed by 3 days of intense training, some suffering…..a bit of exhaustion….a host of PB’s for many, milestones for others, continuous laughter and bucket loads of camaraderie and team spirit. Day 1 greeted us with much welcome rain. A quick warm up to Beachview and loops of big gear hill work. Thanks to our clever coaches the loops ensured that we were never out of sight of each other and Coach Ray could whiz up and down giving advice and encouraging words. Our amazing fellow team members/volunteers/marshalls kept us safe while getting soaked. Thank you again Claudia, Natalie, Neylese and Jurisa. Storming past me up the hill our beautiful, kind hearted PRO Annah Watkinson took time to encourage me and give some advice “keep your body still Mischie”. A ways behind her Coach Ray trying to keep up……. Tough getting old ;). A midday swim session with Ray, Natalie and Kelly vd Toorn filled with drills and swim stroke correction. To end the day a run at Hobie Beach. I started off the run with a very special human and friend, Vuyo Bongela. 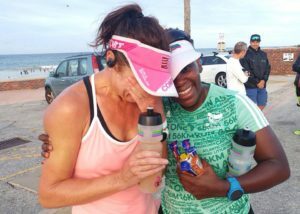 Doing her first IM but a Two Oceans and Comrades finisher. We fell into a natural rhythm although I thought that the pace was way out of my comfort zone I was determined to hang on as long as I could manage. She encouraged me the entire time and I ended up with a 10km PB. Faster than I have ever run. It was a huge breakthrough for me mentally and the tears just flowed, which ended up in Vuyo crying and then Coach Nats in tears. That run and Vuyo will stay with me forever. Thank you sweet girl. Day 2 was booked for a long ride and and a brick session. A convoy of Team Tissinkers set off from Pollock Beach. Loops between Grassroof and Beachview once again ensured that one never felt alone, the back up driver could get to a rider ASAP but more importantly we could stop at the TeamTissink watering point which was more of an oasis than a watering point. Ice cold drinks, yummy snacks, comfy chairs, music and encouraging team members attending to our every need. From the bottom of my heart , once again, thank you to Deidre, Neylese, Jurisa and Coach Nats. You guys were phenomenal. The brick session was challenging in the heat but we ticked that box. A late afternoon sea swim at Hobie Beach had some of the team swim off to Kings Beach as a group and the rest of us had Coach Ray all to ourselves. Practising in and outs. Dolpin diving out and catching waves to body surf back in. It was just so much fun, laughter and a good few of us getting dumped, coming up for air, adjusting goggles and jumping back in to play around like children on holiday. The last one to exit the sea that evening was Coach Ray. He was having a great time body surfing in and out. In bed at 7pm I downloaded my data for the day. Garmin and Training Peaks awarded me a PB medal for my cycle. My second PB so far. Happy girl. An early start to day 3. Port Elizabeth was showing off properly and it was promising to be a blazing hot day with very little wind. 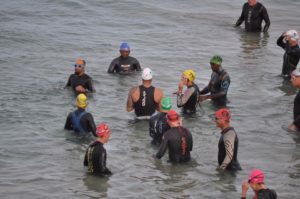 A sea swim followed by a 40km cycle to warm the legs up for the main session of the day, the long run on the IM course. I would be lying if I said I wondered how I was going to get through this run. My body felt tired. The first 5km were awful, I could not find my legs. Stopping at the main watering point I was given a pep talk by Coach Nats and words of encouragement and a kiss from the hubster. My spirits lifted and I forged ahead. Watering points with our amazing volunteers were scattered along the route and the ice cold drinks, smiles and words of encouragement boosted my every step. I truly feel our volunteers/team mates played an integral part in the amazing weekend we all had. Somewhere along the route I got comfortable, found my legs, went into a happy space and had my 3rd PB for the weekend. I could not have been more stoked. The below quote would be an apt description of how I feel about my TeamTissink tribe. 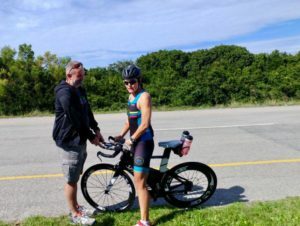 I am in awe when I see our top athletes in action, I am inspired by those that consistently, relentlessly with determination work everyday to be better triathletes, I am humbled by those that give up precious family and training time to selflessly support their fellow teammates towards their IMSA journey. We would do the same for you in a split second. It takes a family, and that is what we are. Thank You to our TeamTissink sponsors whose contributions helped make this weekend spectacular.